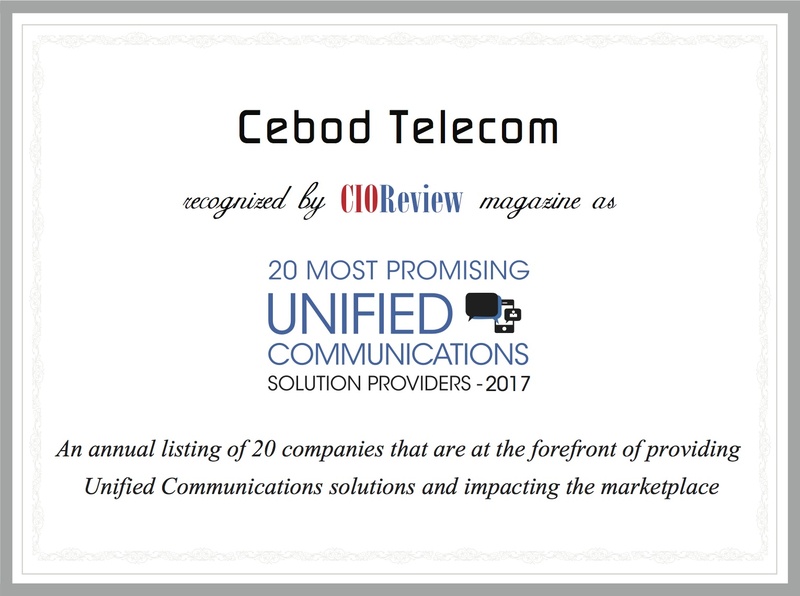 DIDforSale is proud to announce that their sister company Cebod Telecom one of the fastest growing Unified Communication provider in US, has been recognized among 20 most promising unified communication provider for 2017. Cebod Telecom is a global VoIP business phone service provider. As telecommunication industry is completely transforming, Cebod Telecom makes it easy for their customers to move to cloud. Traditional PBX systems not only require huge upfront cost but also ask for costly ongoing upgrades and maintenance. By switching to hosted PBX solutions companies have been able to eliminate huge hardware costs, onsite IT staff to manage phone system and other maintenance costs. Not only do they save money but also get access to a hosted phone system that they can manage and configure on their own. And it takes about 5 minutes to set up this new phone system. Leverage 30-day money back guarantee to make the decision. Cebod Telecom offers wide selection of products and plans to meet the unique requirements of various industries. Visit Cebod Telecom to learn more about Products, Plans and Pricing. Read the complete write up at CIOReview.